I love pasta. But I always wish there was a way to make it healthier. A healthy pasta dish would make me a very happy Italian girl. Well, I found it! ZUCCHINI PASTA! Back in October I had the squash fettuccine at Small Plates in Cambridge. I had been thinking of that “pasta” for months, until I finally decided to try and make it. For some reason I thought that I would need a special tool to make pasta out of zucchini, but I just used my normal vegetable peeler. I know some people (like The Fitnessista) make spiralized zucchini, but I do not have a spiralizer. The process was really simple. I cleaned a zucchini, cut off both ends, and then used my vegetable peeler to make strips. I kept going until I got all the way down to the core where the seeds are. One normal zucchini makes about 1-1.5 cups of pasta. I then steamed the zucchini “pasta” for 2-3 minutes in salted water before topping it with my favorite pasta sauces. Be sure to strain the zucchini well because it gives off a lot of liquid. 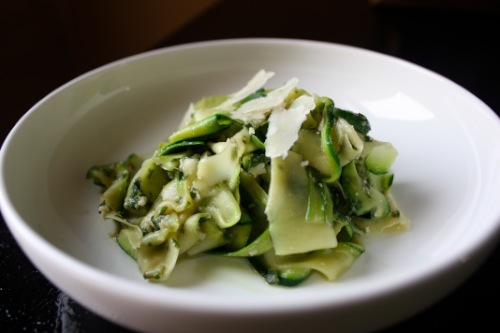 The resulting healthy zucchini “pasta” tastes just like al dente pasta, and is the perfect vehicle for any sauce. I like it more than regular pasta because I really like big portions, but I don’t want to gain weight or feel sluggish. With zucchini pasta I can eat a HUGE bowl for less calories and carbohydrates than pasta, but I also get plenty of vegetable servings too! And it is really delicious. The first sauce I tried was the pesto sauce featured above. For the record, PB loves it just as much as I do and asked that we make it at least once a week! I think that is a success!!! If you have any other suggestions for sauces to eat with this pasta, please share. We are on a healthy zucchini pasta mission! You must try this technique! PB and I celebrated our one year anniversary this weekend. 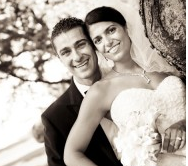 I posted a video of wedding photos yesterday- Check it out! i’m stealing this idea immediately…seriously, it sounds AMAZING! I’ve done this before too and it’s super good! If you’re in the mood, it also works well if you mix it in with regular pasta so you get the normal pasta flavor but more bulk (I usually mix half pasta and half zuchinni). It’s great with shrimp scampi. I think I need to try it. Especially if it doesn’t taste too much like vegetables! @Jessica @ How Sweet, This is actually perfect for someone who doesn’t like vegetables. You can drown the “pasta” in whatever sauce you like!! And if your husband is anything like mine, he will love it too. PB loved that he felt so light after, even though he had his bowl with a monstrous piece of chicken and sourdough bread. i cant stop looking at that picture!! it looks so so good! im also hosting a chobani giveaway if you’re interested! Looks delicious. I am going to try those sauces and make it again this week. This is one of my favorite raw meals. I don’t have a spiral cutter either, but I bet it would be quite useful for carrots and sweet potatoes as well. It is awesome! I have been doing it for awhile, although I normally saute in a little olive oil…when you say you “steam” in salted water, do you bring a small amount of water to a boil and then add zucchini and turn off heat?? Or do you boil it in water like pasta? I sometime will combine with regular pasta, to make the boyfriend more interested in eating it! @Carla, Sorry I actually steam it (So I have a pot with a steamer in it) but I add salt to the water anyway. So the zucchini never actually touches the water itself. I think I will try combining it with pasta next time- thank you! @RhodeyGirlTests, Ahhhh…OK I will have to try that sometime! I LOVE this idea! I am totally going to try it next week! I have a spiralizer and I still have not used it to make zuch pasta. Josh likes yellow squash but not zuch…maybe I could win him over with this pasta? What a great idea!! Between this and spaghetti squash, I may never need pasta again. Okay, that’s a lie, but you know what I mean! Oh my! I have tried this but didn’t cook the zucchini I bet I would like it a lot more!! @Raz, TEST. If you received an email with this comment please let me know! Oh my. Think I just found my ultimate recipe – Shaun loves pasta, I’ll make this and see if he notices it’s made out of pure Veggies. Thanks for the great post! Glad I found you on Twitter! Sabrina, this sounds so good, I will try it for sur, also I may try it during the summer with some yougurt with garlic ( a little garlic only as I dont like too much of it) salt and pepper, it should be good too. I’m about to be up to my eyeballs in zucchini from my garden, so I’m definitely going to be making this! Also, what if you cut wider pieces and made a zucchini “lasagna” with ricotta? @Dawn @ Blonde on a Mission, That ides is BRILLIANT! I didn’t think about that.. or even a zucchini manicotti dish? I just found this recipe and am definitely going to try it- possibly even tonight! I wonder how well it would work with a julienne peeler for more of a “spaghetti” feel?